Former Virginia Gov. 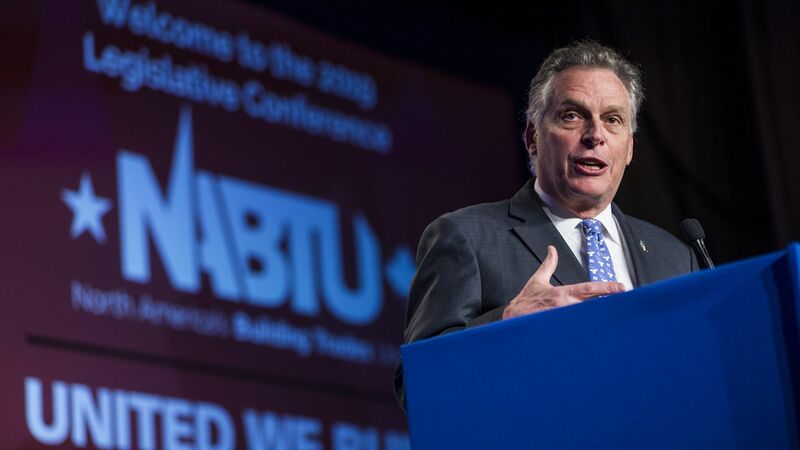 Terry McAuliffe, who has been mulling a presidential run for months, told CNN's Chris Cuomo in an interview late Wednesday that he will not be seeking the Democratic nomination in 2020. Why it matters: McAuliffe said he's laser-focused to help Virginia Democrats flip the narrowly divided GOP-controlled General Assembly, where Republicans hold a 2-seat margin in both chambers, in this year's legislative contests. Virginia Democrats are trying to recover from a political turmoil after 2 of their top state leaders admitted earlier this year to wearing blackface in the past and another accused of sexual assault. "Since February we've had a lot of problems there. We have the opportunity to pick up our House and Senate. To pick up both chambers with the governorship, [would] be the first time in 26 years. As governor, you know I had a record number of vetoes. There are bills I pushed through that just couldn't get through." McAuliffe's move mirrors that of former U.S. attorney general Eric Holder, in which he decided in March not to join the crowded field of Democrats, saying he would instead work to chip away at Republicans’ sweeping control of the redistricting process before the 2020 census count. "The folks we elect this year, they will be around in 2021 when they review all the [voting] maps. In fairness, this election will determine the next 10 years in Virginia. That's why I'm staying home and doing what I need to do to help Virginians." The backdrop: Reports indicated that McAuliffe, a prolific political fundraiser, had been waiting to see whether former Vice President Joe Biden would join the increasingly large and diverse Democratic field as both would run on the same centrist, establishment brand. He originally said he would make his decision by March 31. Leading up to that date, the former governor toured early-primary states. Virginia Lt. Gov. Justin Fairfax (D) said Sunday that he voluntarily took polygraph exams that support his defense that he did not sexually assault two women who leveled accusations against him earlier this year. "When asked: 'Did you engage in any non-consensual sexual activity with Vanessa Tyson?,' Lt. Governor Fairfax answered 'no.' The polygraph examination showed that this was a truthful answer. "When asked: 'Did you engage in any non-consensual sexual activity with Meredith Watson?,' Lt. Governor Fairfax answered 'no.' The polygraph examination showed that this was a truthful answer." The big picture: Fairfax has faced significant pressure to resign since the allegations were made in February. Both Vanessa Tyson and Meredith Watson, whose interviews will air on CBS "This Morning" on Monday and Tuesday, respectively, have said they would be willing to testify before the Virginia Assembly. Fairfax said retired FBI polygraph expert Jeremiah Hanafin administered the polygraph test. Hanafin is the same person who performed a test on Christine Blasey Ford, one of the women who accused Supreme Court Justice Brett Kavanaugh of sexual misconduct during his confirmation process last year. In a statement, Fairfax's attorney Barry Pollack said his client will fully cooperate with any law enforcement investigation into the allegations: "A meaningful, professional factual investigation would exonerate the Lt. Governor and clear his well-earned good name and reputation."